The electricity supply was off at 3am in the morning for the whole of Kota Kinabalu areas, I was also told that other districts like Labuan, Tawau also having the same problem. 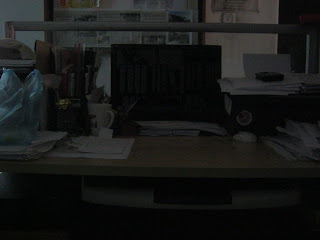 I came into the office in total darkness yesterday morning. This is my office desk. We haven't got any emergency light installed, even if we have one, the power would have been exhausted after 2-3 hours. Nothing much can be done in the office as most of my work is highly rely on computer. After many hours of waiting, the power only resumed at 11am at my workplace. Some areas got their power restored as early as 7am, I believe Tanjung Aru area was the last place to get their electricity supply back. We do not know exactly what happened, I hope this will not happen again, as it has caused so much inconveniences, the traffic was terrible without traffic lights, all of us could not get enough sleep due to stuffiness, just imagine life without out electricity supply for hours.